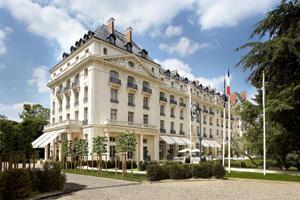 Witness the splendour of France’s leading luxury retreat at Trianon Palace Versailles, The Waldorf Astoria Collection. Situated less than a mile from the world famous Chateau de Versailles, and only 20 kilometres outside Paris, this fashionable Chateau de Versailles hotel recently benefitted from an artful, full-scale redesign, adding an air of tasteful, modern elegance to our atmosphere of regal luxury. Find solitude among centuries-old trees and lush, vivid gardens, newly updated by famous landscape designer Louis Benech. Experience a splendid reflection of our palatial surroundings within the sumptuous style and decor. Enjoy indulgent features, from lavishly appointed accommodation and an exquisite French restaurant by legendary Chef Gordon Ramsay, to the Spa Guerlain with a hammam, steam rooms and a beautiful, heated, indoor swimming pool. Yet even with these special comforts, it is our personalised level of service that sets us apart from the standard Paris Versailles hotels.